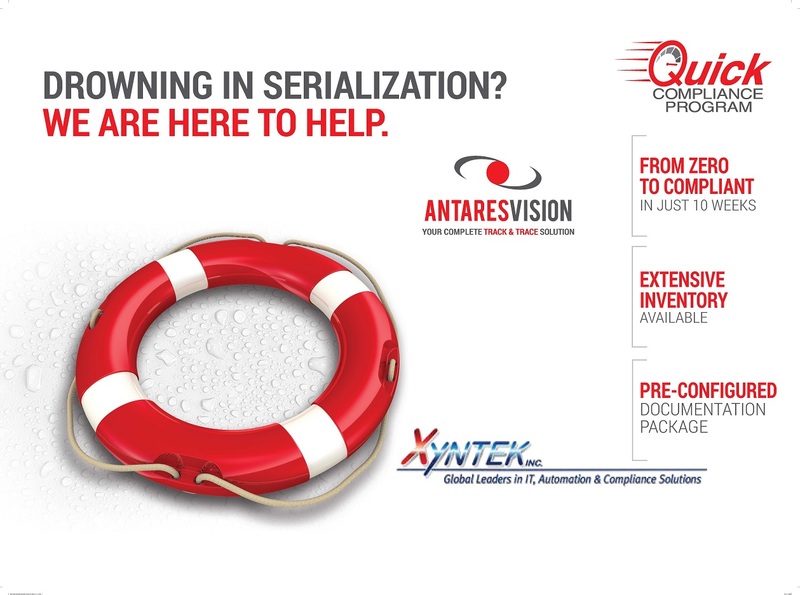 Xyntek & Antares Vision launch Serialization Quick Compliance Program - Xyntek Inc.
Xyntek and Antares Vision, the world’s leading partners of serialization-based track and trace solutions will stress its heightened availability of ready-to-deploy serialization modules in the coming months. Of note, the companies will showcase its new Quick Compliance Program, which draws upon a large lineup of available modules and solutions to enable compliance within 10 weeks from the project start! Accessibility of infrastructure and speed to deployment have become paramount as U.S. regulatory deadlines loom. The next milestone for manufacturers to comply with 2013’s Drug Supply Chain Security Act is November 27, 2017, by which date pharmaceutical manufacturers are required to print a unique product identification code on all Rx units of sale and homogenous cases distributed domestically. The looming deadline makes the Antares Vision Quick Compliance Program particularly prescient. The program encompasses standardized package of software, documentation and services, and minimizing Project Management Office (PMO) efforts by pre-preparing validation documentation.